Peptide (C)RNWKRPSEQLEAQH, corresponding to amino acid residues 256-269 of rat OX1R (Accession P56718). 3rd intracellular loop. Homology Mouse - identical; human - 9/14 amino acid residues identical. Standard quality control of each lot Western blot analysis (unlabeled antibody,#AOR-001), and immunohistochemistry (labeled antibody). Immunohistochemical staining of perfusion-fixed frozen rat brain sections using Anti-Orexin Receptor 1-ATTO-488 Antibody (#AOR-001-AG), (1:60) and Anti-Parathyroid Hormone 1 Receptor (extracellular) Antibody (#APR-051), (1:60). A. 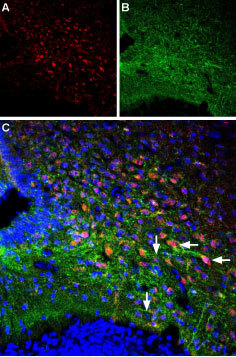 Sections were incubated Anti-Parathyroid Hormone 1 Receptor (extracellular) Antibody, followed by donkey-anti-rabbit-Cy3 (red). B. The same sections were incubated with Anti-Orexin Receptor 1-ATTO-488 Antibody, (green). C. Merge of A and B shows staining of OX1R in nerve fibers (vertical arrows) while Parathyroid Hormone 1 Receptor is apparent on cell bodies (horizontal arrows). Cell nuclei are stained with DAPI (blue). Sakurai, T. et al. (1998) Cell 92, 573. Kukkonen, J.P. et al. (2002) Am. J. Physiol. Cell. Physiol. 283, C1567. Kirchgessner, A.L. (2002) Endocr. Rev. 23, 1. Sakurai, T. (2007) Nat. Rev. Neurosci. 8, 171. Orexin Receptor 1 (OX1R) (also known as hypocretin receptor 1) is one of two receptors that recognize the peptide neurotransmitters orexin A and orexin B.1 Orexin A and B are 33 and 28 amino acids in length, respectively, and are derived from a common precursor termed prepro-orexin. Both OX1R and OX2R belong to the 7-transmembrane domain, G protein-coupled receptor (GPCR) superfamily. The physiological functions of the orexin system (OX1R, OX2R, and their ligands) have been a matter of intense research in the last few years. Anti-Orexin Receptor 1 Antibody (#AOR-001) is a highly specific antibody directed against an epitope of the rat protein. The antibody can be used in western blot, immunocytochemistry, and immunohistochemistry applications. It has been designed to recognize OX1R from rat, mouse, and human samples. Anti-Orexin Receptor 1-ATTO-488 Antibody (#AOR-001-AG) is directly labeled with an ATTO-488 fluorescent dye. ATTO dyes are characterized by strong absorption (high extinction coefficient), high fluorescence quantum yield, and high photo-stability. The ATTO-488 label is analogous to the well known dye fluorescein isothiocyanate (FITC) and can be used with filters typically used to detect FITC. Anti-Orexin Receptor 1-ATTO-488 Antibody is especially suited for experiments requiring simultaneous labeling of different markers. Anti-Orexin Receptor 1 Antibody (#AOR-001), (for western blot analysis).